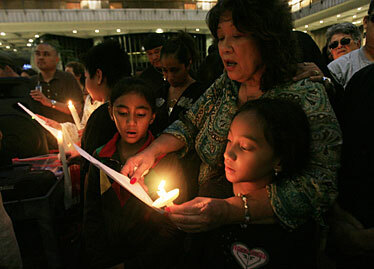 Supporters sang "Amazing Grace" during a candlelight vigil for Cyrus Belt and Janel Tupuola Jan. 22 at the state Capitol atrium in Honolulu. Tupuola was beaten to death Jan. 16; her ex-boyfriend has been charged with murder. Cyrus Belt died Jan. 17 after being thrown or dropped from a pedestrian overpass onto the H-1; Matthew Higa was charged with murder in the case. After the death of Cyrus Belt, I cannot believe no one has realized that if he had been in a licensed home care or a child development center accredited by the National Association for the Education of Young Children, he would have been safe. Unfortunately, most child care for someone his age is very expensive and the waiting lists are up to 18 months long. There is not enough high-quality care for Hawaii's youngest children. A child's most important time of learning is 0 to 5 years old. Research has shown if a child is given the right environment and experiences they have unlimited potential. Where are the funds for high-quality child care to help young families of Hawaii? We were on a ship called the Bremen sailing in the seas of Antarctica. Far away from civilization. The only news we got was from the daily sheet of paper faxed to the ship by the New York Times. Icebergs were all around us. Penguins and seals and whales. We opened the paper and read the news. Even at the South Pole the story of Cyrus was big news. "Honolulu" the dateline said ... and the rest of the story of a little boy's death is now known. When we travel we are ambassadors for Hawaii. We promote it. That day we had no words! Only God bless the little boy named Cyrus. Two recent violent deaths in our state have severely affected our community. MADD Hawaii would like to extend our sympathy and assistance to the families and others who are now suffering from the trauma and pain of those violent crimes. As the memorials for the victims continue to grow, we would like to make the community aware that there is a peaceful place for them to grieve and honor these victims, as well as others who were violently killed or injured in our state, year round. MADD Hawaii dedicated the Victim Memorial at Kakaako Waterfront Park to honor the memory of those whose lives were lost in drunken driving crashes and other violent crimes. All members of the community are welcome to visit the memorial which is located on the Ewa end of the park. The memorial depicts a family trio, each with a void where the heart would have been. Years may go by, but the emptiness in the hearts of victims' families, as well as the community, will always remain. We understand the impact these tragic events have had on the people of our islands, and we would like to offer our grief support to those in need. Please call 808-532-6233 to speak to our victim services staff if you need assistance. The Star-Bulletin was correct in stating in a Feb. 1 editorial that Nancy Chanco's long history of drug abuse did not contribute "directly" to her son Cyrus' tragic death; but clearly her long struggle with drug dependency was a contributing factor to his senseless loss. While you have printed several letters that say "don't blame the mother," it provides me no comfort to say that Chanco could have done more to protect her child and Human Services clearly had ample evidence to remove Cyrus out of a dangerous situation; at least for the short term for his own protection. Matthew Higa allegedly was the direct cause of Cyrus' death; but some recognition from Chanco of personal responsibility for her children's welfare is not uncalled for. If this is viewed as "blaming the mother," then I'm very sorry. In the meantime, the Star-Bulletin should give its full support to Rep. Josh Green's, chairman of the House Health and Human Services Committee, efforts to craft legislation that may result in saving other children from harm. A Jan. 16 Star-Bulletin article reports that Rep. Kymberly Pine intends to submit a bill in the Legislature requiring automatic transfer of juveniles accused of committing a variety of crimes to be tried in adult Circuit Court. Such a law would adversely affect a surprisingly large number of our state's youth and their families. Most importantly, there is substantial empirical research that shows with remarkable consistency that compared with youth in the Family Court system, those juveniles waived over to adult court reoffend quicker, more often and more seriously. Sending kids to adult court does not increase community safety; it actually reduces it. In his Jan. 31 letter, "Mayor has good ideas for handling trash," Micah Goshi wrote, "The second plan is to ship the trash out. This option obviates the landfills altogether." No, it doesn't -- it only obviates the landfills where you have to live with it! ...Maybe we should ship our trash over there! We should not be wasting our legislators' time by submitting moratoriums or bills banning GMO (transgenic) research. A few legislators continue to introduce negative bills against the progression of biotechnology. Here we are again pitting farmers against farmers. Instead, positive bills for the advancement of biotechnology of a specific crop, whether it be biotech, conventional or organic, should be supported by all in a unified voice. Sen. Russell Kokubun, Sen. Jill Tokuda and Rep. Clift Tsuji have always taken a positive position in their introduction of bills. Agencies, legislators and specialty groups are sometimes pressed to "pick sides" among biotech, conventional and organic production, but all three production systems are critical to the economic viability and sustainability of Hawaii. That attention should now be focused on how farmers opposed to the technology and those in favor of it can step back from the controversy and successfully produce and market their crops as they see fit. On Dec. 26, we started to notice the first University of Hawaii Warrior fans finding their way to Johnny White's in the French Quarter. The Hawaii fans were by far the best in 15 years. Jeaneen and I will never forget the aloha, the gifts and the love extended to us and our staff. To the young men and women who called us "Uncle" and "Auntie," you touched our hearts. You could have said "Cuz," but I'm sure my gray hair and balding head gave you no choice. The crowds were tremendous and the Hawaiian spirit was at its peak. The excitement was contagious and people were happy to be anywhere. Folks were running into friends they hadn't seen in years. When I think of Willie K leading hundreds of fans in "Hawaii Ponoe," I still get chicken skin. When Villi did his Warrior dance in the middle of Bourbon Street, it stunned the Georgia fans. The haunting echo of the conch shell being blown off the balcony drew people in our direction. Getting to meet Colt Brennan, Dan Kelly and some of the rest of the team was unforgettable. While the game had a sad ending, the team had a historic year. The economic impact of the Hawaii fans was tremendous for the city's businesses. Everyone we know still talks about the Hawaii fans' politeness and friendliness. We'd like to thank Mayor Mufi Hannemann for coming by as it was great to see him and Gail. Thanks to the Star-Bulletin and its staff -- Gary Chun, Jamm, Ritchie and Chuck Parker. Thanks also to Howard D., Manolo, R. Kekaula, Bobby Cannon and Liz Chun. We met so many Hawaii people and fans who showed so much aloha. We will fly the state of Hawaii flag all year round so that visitors from Hawaii are sure to find a warm smile, a friendly handshake, a cold beer and someone looking for "talk story" about home. If anyone would like to share their pictures with us that we might put in our photo album or possibly on our bar wall, please e-mail them to us at lsapir1@cox.net. You can also write to us at Johnny White's Pub & Grill, 718 Bourbon St., New Orleans, La. 70116. Mahalo and aloha. Have you ever wondered what the person in the checkout stand in front or behind you is going to do with the ingredients in their grocery cart? Ten people could have ground beef, eggs, flour, tomatoes, lettuce and vanilla ice cream, but the outcome at the dinner table will be totally different. One might make meat loaf, another curried burgers, another tacos, another sloppy joes, another spaghetti and meatballs. The ice cream could turn into hot fudge, strawberry or butterscotch sundaes, banana splits, cones or pie ala mode. In the same essence one person can buy a piece of land, buy the same materials for a house as 10 other people and each will have a totally different structure from the other. ...Ten people read a letter to the editor; one thinks it's great, another thinks it's terrible and another thinks it's Pulitzer Prize material. Sen. John McCain is the right person to be our next president. He has what is needed in a president --experience, especially in defense, terrorism and foreign policy. He is a man for change; just as importantly, he has always been bipartisan. He worked with Democratic Sen. Russ Feingold on campaign finance reform and helped pass the required legislation. He has worked with Sen. Barack Obama on immigration reform. As president, he would work to end the partisanship between the White House and Congress. McCain is a man of forthrightness, independence and an optimist about America. He believes we can overcome al-Qaida, global warming, a possible recession. He is an American hero when heroes seem few and far between.